Living in Great Britain it is hard to escape catching Queen’s Diamond Jubilee fever. Turn on the telly, flick on the radio, open a magazine or even glance at a newspaper, it’s all crowns, corgis and Queen. Resistance is futile. Celebrating 60 years on the throne, Queen Elizabeth II is pulling out all the stops: a 1000 boat flotilla down the Thames, a Brit-tastic Diamond Jubilee Concert, the releasing of thousands of beacons, the holding of thousands of street parties, and many more events, big and small, over the four day super-weekend. Even in Scotland, not quite a hotbed of royalism, there is a soupçon of Union Jack bunting, and displays of patriotic biscuit tins and tea caddies in the more English of shops (ie, Waitrose and Sainsbury’s). Yep, we’re going all out North of the Border. But even if the Scots haven’t quite got into the spirit of it all – I may be generalising here – I do think most of us will try and catch some of the coverage on the telly. It promises to be spectacular, monarchist or not. I may even have to watch the Apprentice final on repeat, such has been the effect of the pre-Jubilee media saturation on the decision-making part of my brain. And I’m starting to get a bit excited. Are you? We plan on celebrating the Queen’s Big Event by eating, watching the wall-to-wall BBC coverage and acquiring more hens. A bit atypical that last one, but the first two require no explanation. And we plan on combining the telly watching with the eating. In amongst the crustless cucumber sandwiches (yes, really; we are going trad here), coronation tofu (not really; we aren’t that sad) we shall be fighting over these two white chocolate popcorn treats. Are you planning anything special over the Jubilee long weekend? Any of you ‘Commonwealthers’ celebrating in style? 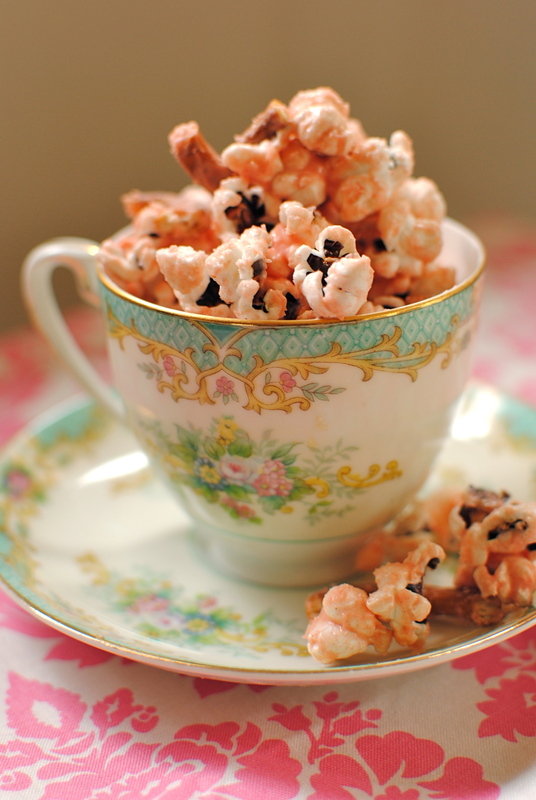 For all of you non-Brits, what are your favourite nibbles to scoff on special days? By the way, here’s the Queen’s official Diamond Jubilee website if you want links to all the events. And a jolly nice website it is too, Ma’am. Miss R’s Track of the Week: Gary Barlow’s (and a bunch of talented Commonwealth children and musicians) Official Jubilee Song – “Sing”. Fantastic video. Really fantastic. I defy you not to smile. 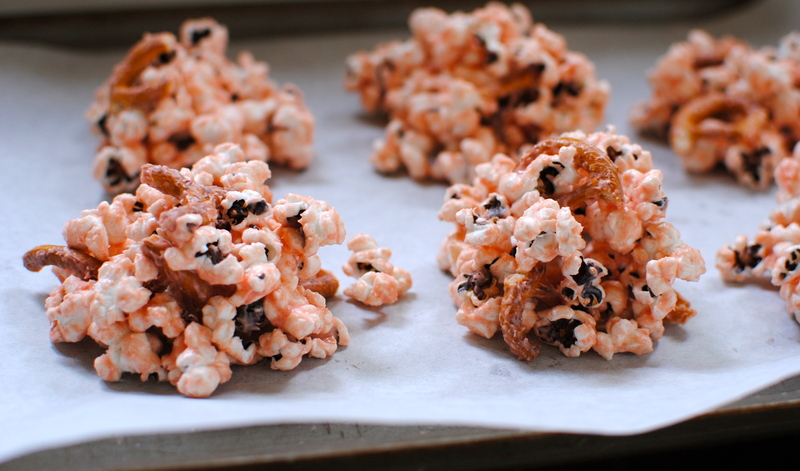 These may be the easiest and tastiest treats you make all summer. 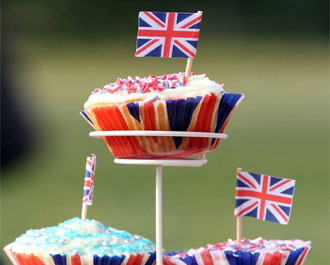 Perfect for nibbling during the Queen’s Diamond Jubilee celebrations. 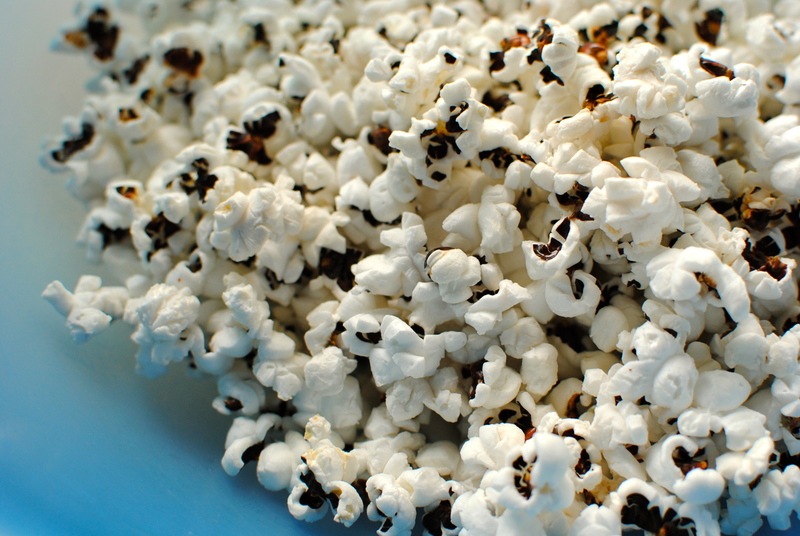 Heat the popcorn over a medium flame until most kernels have bloomed. Decant onto a tray to cool; mix in the broken pretzels. 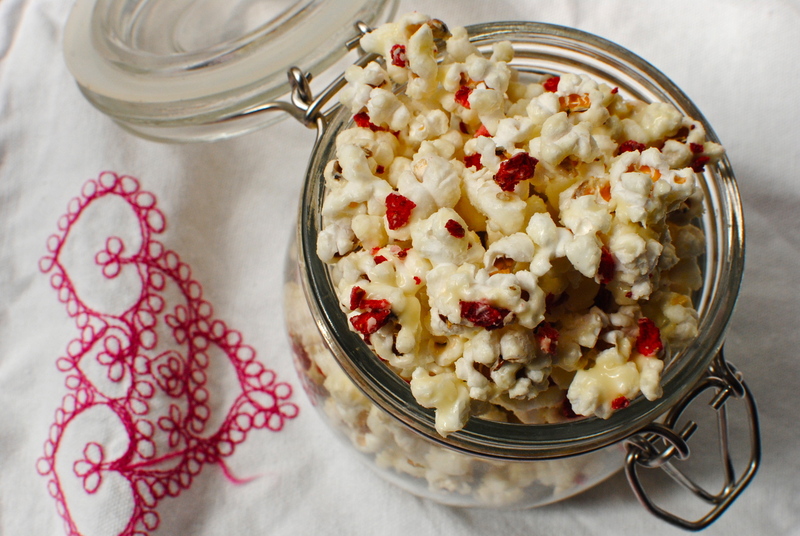 Get on with the chocolate while the popcorn cools. Pop the chopped white chocolate, drops of rose water and the food colouring (if using) into either a glass bowl or the top part of a double boiler. Set either over just boiled water. Because white chocolate is quite a fickle thing I try to resist the temptation to actually simmer the water as this kind of chocolate does have a tendency to ‘seize up.’ If it does seize, just whisk in a tablespoon of oil or butter and it should smooth out. 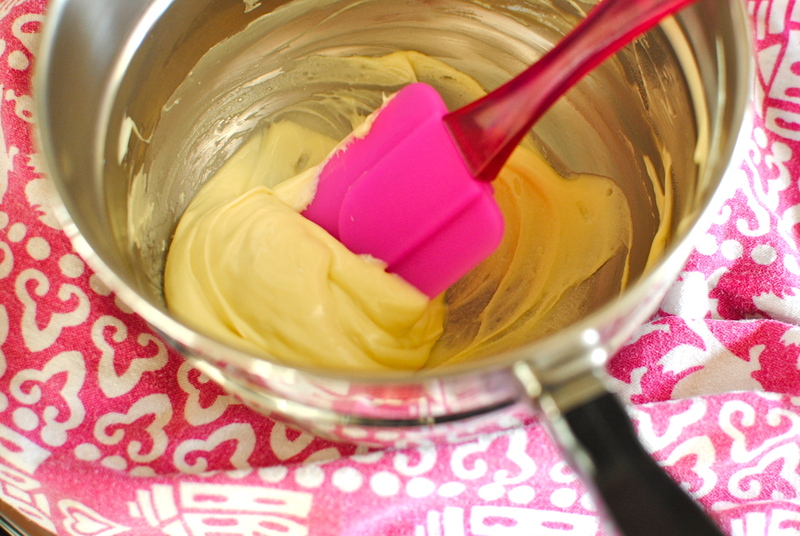 Melted white chocolate is not silky smooth like melted plain chocolate, remaining a bit stiff and not as biddable. If you haven’t worked with white chocolate before do have a look here for an excellent how-to guide. Anyhoo, let the chocolate soften over the residual heat before mixing with a spoon or spatula. It is important to add the rose water and the dye before melting, as melted white chocolate is not on speaking terms with liquid. It is, however, quite happy to share a pan as it melts. Told you it was fickle! 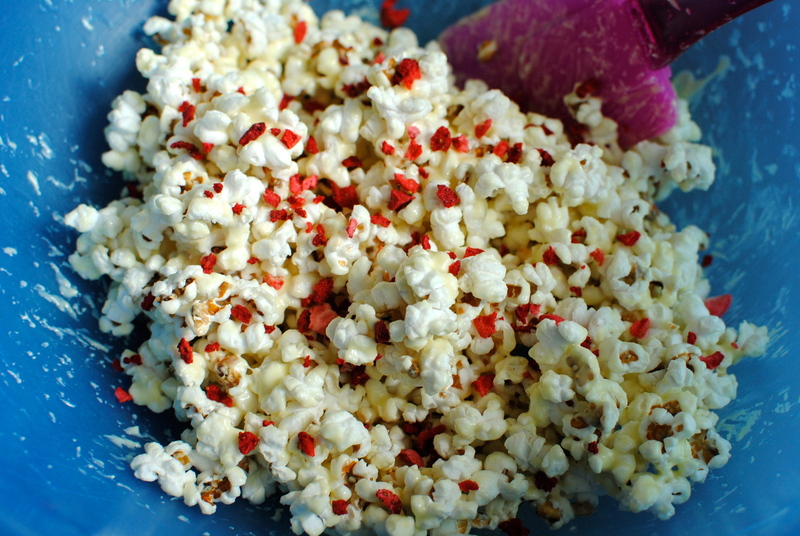 Now pour this over the cooled popcorn as evenly as you can. 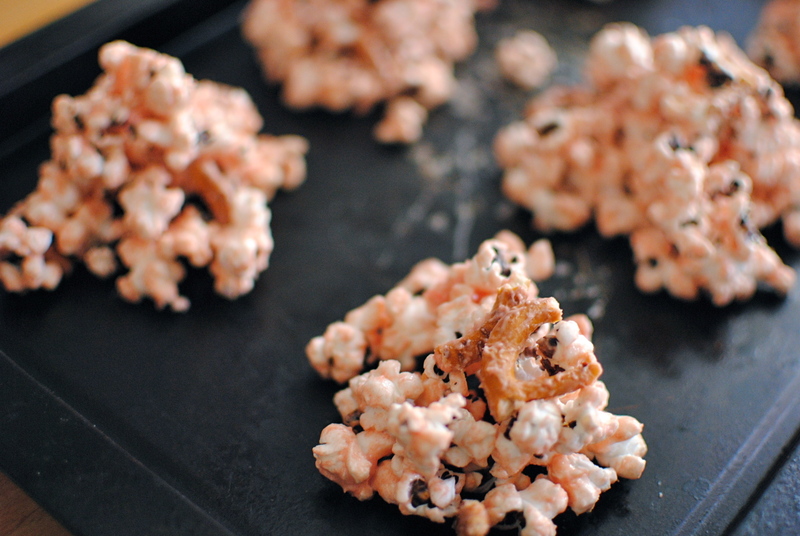 Carefully toss the popcorn and chocolate together and sprinkle over a little salt if you like. 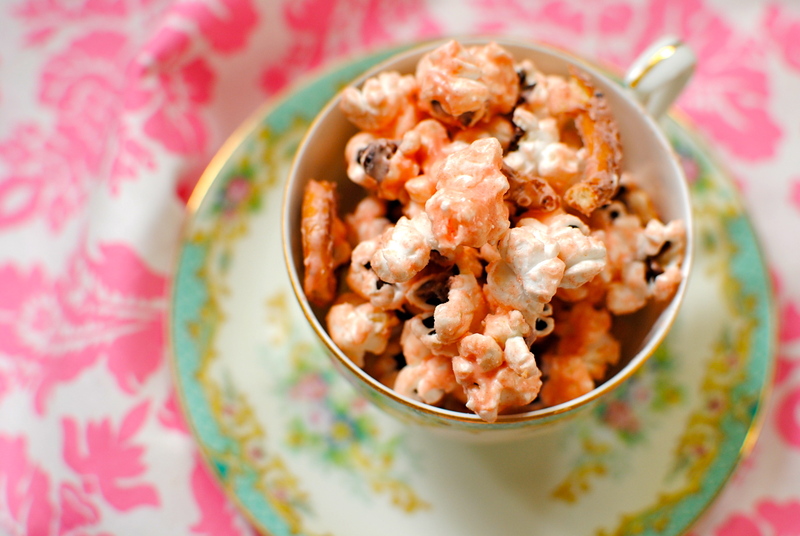 Portion the white chocolate popcorn while warm, or pop it all into a big bowl for immediate devouring. Lovely with a glass of Prosecco! * number of drops dependent on how strong the rose water is; you don’t want it to taste like you’ve dropped it all in a rose bed, just a background fragrance. Carry on as the above recipe, adding the oil or butter with the melting chocolate. 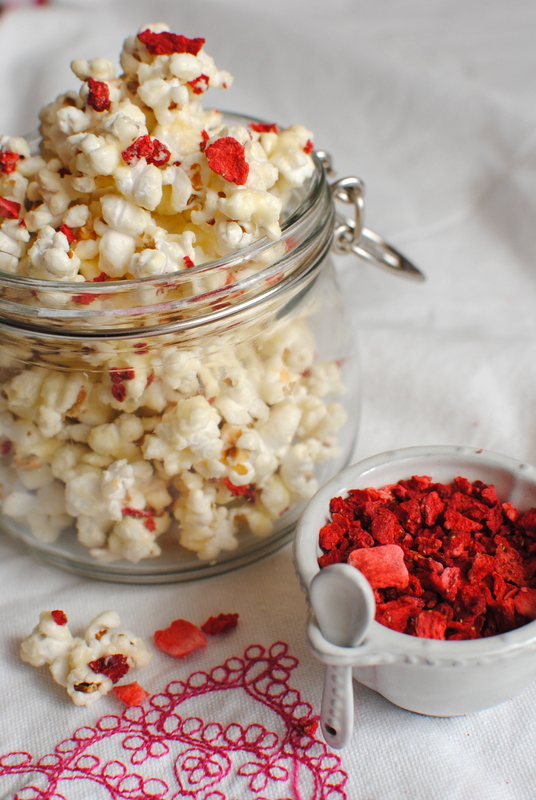 Mix all together with as much of the freeze-dried strawberry pieces as you like. I don’t put salt in this recipe but you may like to. I am investigating boosting the fruitiness of this special treat by making my own strawberry extract. Watch this space! Thanks so much. I’ve since made a much pinker batch for Miss R’s birthday party (and I’ve got the pans waiting to be washed up!). Thanks Miss R for link to Oficial Diamond Jubilee song. It’s lovely and I’ve downloaded it to my desktop so listening to and watching it again and again. You are very welcome. There just couldn’t be any other song this week! 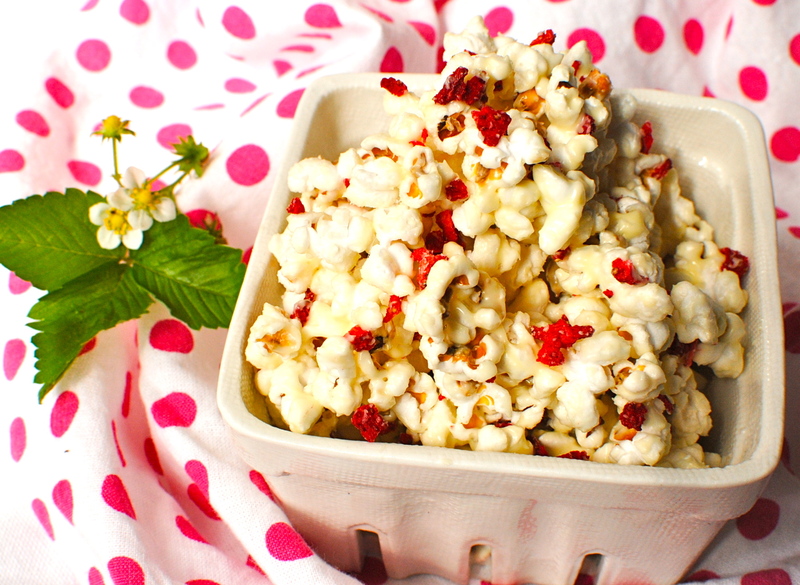 I had initially made it without but while it was still warm I put a dab of rose water on my finger, picked up some gooey popcorn & thought, yep, this is it. I like it plain too but rose water is kind of magical. Thanks for commenting, EA. Oooh, how elegant and beautiful, what an amazing idea. The opening photo is cracking – sorry to be such a colour nerd but what perfect buff wall you have behind the tea cup! 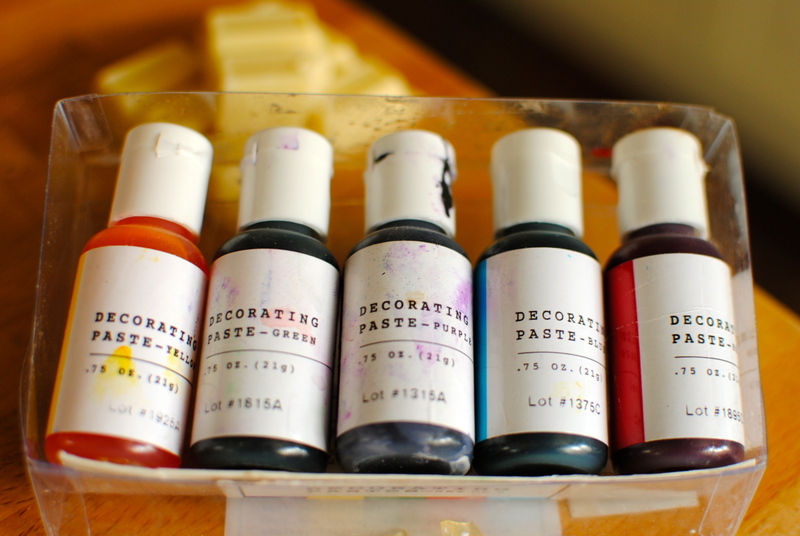 Farrow and Ball eat your heart out – quite literally too! Thanks love! It’s not Farrow & Ball but something from Johnstone I think, called Hessian. Still sounds posh though. As if! You know how we South Asians like our Rose water. It’s really popular in the Mid East too. I have to try the popcorn now! 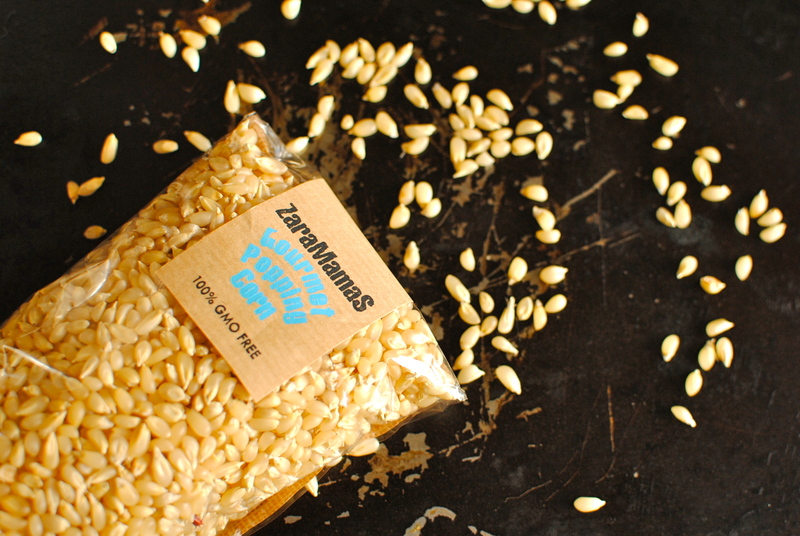 It’ll smell like a Halwaa and taste like popcorn…brilliant! Naah! 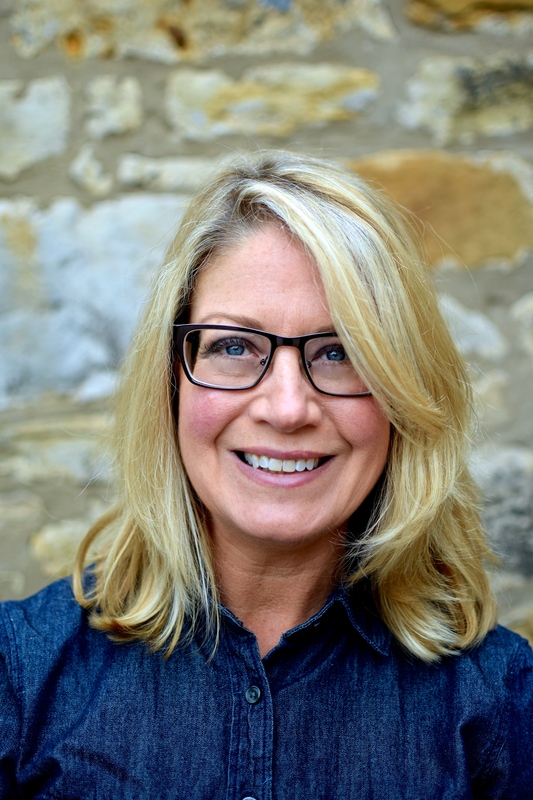 Just think of yourself as the food missionary. Bringing the good flavor to the Scots, hahaha! I’m making a union flag pavlova using raspberries and blueberries tomorrow. Bring your camera! Awesome. We can’t wait to see you two. It’s been almost a month! woo can’t wait for the jubilee! Just figuring out what I’m going to bake now 🙂 these look lovely, a nice contrast to the usual caramel popcorn. Thanks a lot. I’ve seen a lot of awesome baking ideas. Karen over at Lavender and Lovage just had a great floral themed baking round up. Lovely stuff there.